Porsche has recently confirmed that the Porsche 918 Spyder Concept which was first exhibited during the 2010 Geneva Auto Show will go into a limited edition production next year in September. To celebrate the announcement, Porsche has revealed new photos and information regarding the 918 Spyder's specifications. At first, when the Spyder stole the spotlight during the 2010 Geneva Auto Show, the supercar boasted it could go from 0 to 62 in 3.2 seconds whilst reaching a top speed of 198 miles per hour. Under its hood the earlier prototype concealed a 500 horsepower V8 engine alongside three electric motors that produced 215 horsepower, for a total of 715. Things have changed since the 918 was first unveiled in 2010 and according to Porsche, the Spyder is now motivated by a 570 horsepower 4.6 liter V8 engine and the electric motors rated at 200 horsepower, for a total of 770 HP. The results are a top speed of 200 miles per hour with the ability to go from 0 to 62 in under 3 seconds. The 4.6 liter engine is coupled with a 7-speed PDK dual-clutch gearbox which sends its power to the rear wheels, whereas the front wheels will be motivated by the electric motors. 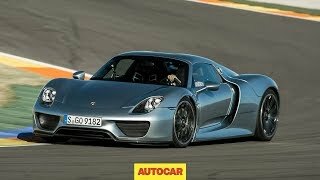 Furthermore, whilst the newest Porsche 918 was able to do a lap of Nürburgring in just 7 minutes and 22 seconds (which means it's faster than the Chevrolet Corvette Z06, Porsche 911 GT2 RS, Maserati MC12, Pagani Zonda F and the Ferrari Enzo) it retained the same fuel consumption we were all impressed about two years ago. 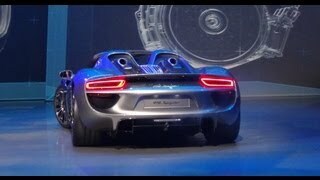 In other words, the 918 will cover 94 miles per gallon and will produce 70 g/km carbon dioxide. In addition, the E-Drive mode allows the Spyder is able to cover 16 miles on electric power alone, whereas Race Hybrid mode will maximize both the electric and gas unit output. The middle ground is covered by the Sports Hybrid mode which adds Torque Vectoring for high performance and decent fuel consumption. Other notable features that make this supercar special are the fully adaptive aerodynamics, adaptive rear-axle steering and the carbon fiber monocoque. As far as availability goes, the Porsche 918 Spyder is set to be made available for purchase in September 2013, and despite the fact that over 1,000 people have shown interest in buying the new Spyder, the latest bits of information indicate that only 918 units will be produced. Price-wise, the supercar is considered to be unnecessarily pricey by some, and with a price tag of $845,000 you can't really blame them.